Buying a gift? Can’t decide? Gift vouchers are the answer! Friends, family, collegues and neighbours will love you for buying them a Sarah C gift card! Gift cards can be purchased in any denomination and are custom made with your message. They can be redeemed on indoor and outdoor art from Sarah C. To purchase, select the value you want to load to your gift and proceed to check out. 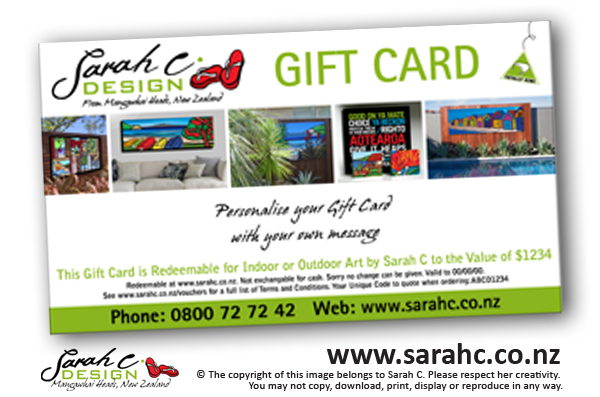 Or send us an email and we can pop in any denomination you want to give Email sarah@sarahcdesign.co.nz or call 0800 72 72 42. Please Note: We email Gift Cards to you as a digital file so you can either email to the recepient or print and gift.